Please feel free to sign our guestbook if you so wish but we also have a Forum or "Message Board" which you can join. At present the forum has over a hundred members who view and post messages, some on a daily basis. The forum can be accessed from the home page of the site by clicking on the "Message Board" link on the left hand side. Once you have registered please be patient as the account has to be activated manually by the webmaster before you can use the forum. If you have problems registering you can contact the webmaster by using the "Email" link in the site menu. This was our second guestbook. Unfortunately for some reason it ceased functioning. The pages were saved, however, and you can read them by using the links below. This was our third guestbook. Unfortunately we had to stop using it because it was suffering a huge amount of spam. The pages were saved, however, and you can read them by using the links below. 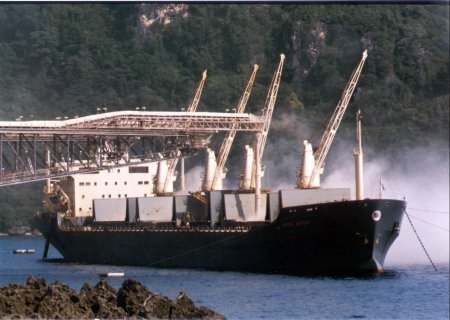 The Govan Class bulk carrier M/V Baron Napier loading phosphate in Flying Fish Cove, Christmas Island. The two conveyers were able to load the ship with 24,000 tons of cargo in eight hours. This cargo was bound for New Zealand.